Benyamin Nuss Plays Uematsu is one of the first major attempts to bridge the disparate worlds of ‘video game music’ and ‘classical music’ together. Released by esteemed classical label Deustche Grammaphon, the album features 15 performances by Universal Music’s Benyamin Nuss, based on the original melodies of Japan’s most famous video game composer Nobuo Uematsu. The virtuoso pianist performs complex and emotional arrangements of music from the RPGs Final Fantasy, Blue Dragon, and Lost Odyssey — created by experts of the video game, classical, jazz, and popular music worlds — and also interprets two original compositions. The album attempts to both appeal to Nobuo Uematsu’s existing fans and also introduce new classically-oriented listeners to the modern concept of video game music. Does it succeed in both of these goals? Benyamin Nuss Plays Uematsu certainly impresses as a demonstration of Nuss’ mastery. Though he only had three months to learn the majority of the material, he interprets every score with technical finesse and emotional sensitivity, and shows command of a range of styles and moods. The arrangers certainly offered him plenty of demanding material to perform, ranging from lavish arpeggios opening the Final Fantasy VII fantasia to the relentless succession of dissonant chords on Final Fantasy VIII‘s “Liberi Fatali”. The performer’s passion for Nobuo Uematsu’s music and Final Fantasy also ensures he is able to bring out the emotions lying behind the original melodies, whether the tragic mysticism in “Terra’s Theme”, the playful wanderings of “The Serpent Trench”, or the bittersweet nostalgia of “Where I Belong”. It’s clear that Nuss dedicated his debut album to the composer principally out of love, not simply commercialism. For the most part, the album succeeds in offering fresh yet familiar interpretations of Nobuo Uematsu’s compositions. Focusing on “Where I Belong”, for instance, Bill Dobbins is able to recapture the youthful exuberance of the original melody and also achieve quite a bit more beyond that. The initial section of the arrangement has a fairly straightforward ‘melody with accompaniment’ approach to it. However, the introspective moments between the phrases and the ad-lib performance by Nuss ensure it also provides a very personal psychological insight. As the arrangement develops, it grows more harmonically lavish, with influences from great jazz pianists and romantic composers. In this case, Nuss nevertheless shows a sufficient amount of restraint to ensure that the harmonies colour, rather than overwhelm, the melody. The result will be deep and satisfying to both intended audiences, despite the intrinsic simplicity. Some arrangements on the album are even more transformative, however. What Torsten Rasch achieves on “A Place to Call Home” is simply magical. The once mundane modal melody is given new life with its surprisingly abstract and diverse treatments here. Rasch even took the liberty to significantly broaden the melody’s scope, allowing it to offer a much more deep and fulfilling climax at the 1:55 mark. The item is made all the more meaningful with Nuss’ thoughtful interpretation of the enigmatic score. Later in the album, the once simplistic piano solo “Waterside” is transformed by Jonne Valtonen into an impressionistic array of complex runs, arpeggios, and unusual, evocative chords. Aside being technically marvelous, Nuss’ performance will inspire vivid imagery of an ever-developing water scene, to Blue Dragon veterans and remarkably unfamiliar listeners alike. The album offers spectacular stylistic and emotional range too. Softer entries such as “A Sign of Hope” and “My Tears and the Sky” will inspire tears among those who have played Lost Odyssey and Blue Dragon. The former by Shiro Hamaguchi is reminiscent, but generally superior, to his straightforward but heartrending interpretations on the Final Fantasy Piano Collections. The latter by Jonne Valtonen is far more ambitious despite somewhat limiting original material, slowly blooming from its fragile minimal origins towards an uninhibited self-indulgent climax that reflects all the pain and heartbreak of love. Similar parallels can be made between the action theme arrangements “A Mighty Enemy Appears!” and “Release the Seal”; Hamaguchi’s useful contribution is a crisp and dazzling piece of transient drama, whereas Valtonen’s offering provides a furious and spectacular culmination to the entire album. There are nevertheless times on the album where the original melodies don’t entirely befit the sourced melodies. The main themes for Lost Odyssey and Blue Dragon are the primary examples of this. Both receive highly emotional and technically spectacular arrangements, but are surprisingly more enjoyable in the sections without a melodic focus and sound rather superficial otherwise. The bright, childish, and somewhat clumsy nature of the latter’s melody is especially detrimental for an album aspiring for a mature sound. There are also moments in the album where the harmonic treatment is more troublesome. A major example is “Terra’s Theme”, whose rich falling progressions are lovely, yet become awkward when juxtaposed with the comparatively simple melody. Though many will find it impressive, this arrangement is among several that verge on sounding pretentious and overstated. Alexander Rosenblatt’s “Fantasy Over Themes of Final Fantasy VII” forms the centrepiece of the album. It offers a nostalgic reminiscence of the game’s story with its interpretations of various memorable melodies. Their treatment is delightful in each case — somehow explicit yet subtle at the same time — and the arrangement comes together finely as a whole with its firmly built dramatic arch and ingenious fluid transitions. There are also two exclusive original compositions on the album, “Nobuo’s Theme” and “Years & Years”, created respectively by Benyamin Nuss and Nobuo Uematsu as dedications to each other. Both develop gently from their pensive melodic introductions towards their beautifully understated climaxes. Though the album’s overall structure is likely to inspire mixed opinions, the placement of these original compositions is just right and the latter is an especially remarkable way to round off the album. 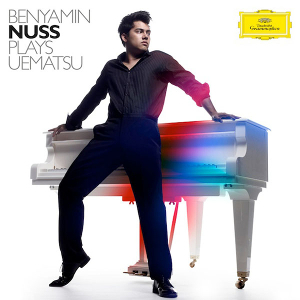 Overall, Benyamin Nuss Plays Uematsu is an excellently conceived, arranged, performed, and recorded album. The most suitable target audience for the album will be those gamers who have grown up loving Nobuo Uematsu’s compositions for RPGs. Though a minority of fans will be alienated by the highbrow approach here, the majority of the arrangements are quite accessible and familiar with their strong melodies and gushing emotions. That said, it is difficult to unconditionally recommend this album to most classical listeners, though many will be pleased by it. There are only a few ground-breaking artistic masterpieces here and a few arrangements are compromised by the simplistic nature — or, arguably, inappropriate treatment — of Nobuo Uematsu’s melodies. This album nevertheless provides the foundations for the bridge between the two musical worlds and will be a spectacle to hear live during the impending European tour. Furthermore, it offers the definitive tribute to Nobuo Uematsu and an excellent debut album from a fine pianist.